The first step in making that difficult “font choice” is knowing the difference between the different types of fonts. Without this knowledge you’ll not only have difficulty mixing and matching the different types of fonts into your website or other design projects, but also will create designs that are almost painful to the eyes. 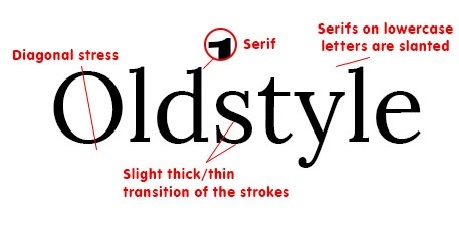 Oldstyle fonts are actually the oldest kind of typeface. Their main feature is their use of sarifs— those little “flags” that you can see on the lowercase letters. You often see this font used in printed material such as novels, magazines, and newspapers. Popular font styles change with the times just like hairdos, fashion, and Starbuck’s coffee flavors. The Modern typeface was meant to replace the out-dated look of the Oldstyle typeface with a newer and younger. As time progressed a new concept emerged: advertising. But not the TV or Internet type. The kind of advertising I’m talking about is large posters, billboards, and the like. The typeface on these needed to be easily read from far away. And so, enter the slab serif typeface. The word “sans” means “without” (it’s French) and as the name implies, sans serif fonts have no serifs. Even though this typeface was created before the computer age, it is one of the best fonts to use for the content (the main text) on a website. Its value comes from the fact that it is very easy to read on a computer monitor. “Script” or “handwritten” fonts are easy to spot and come in many different varieties. The dangerous part of script fonts is that they can dominate a design. That being so, use them sparingly in your designs. Dingbats (ornaments or wingdings) are fonts that contain no letters, only pictures. These little guys are great for making logos, adding decorations next to headings and sub-headings, or to spice up a design. Working as Web UI designer with ONS Interactive Solutions. Having 2+ years working experience in the Adobe Photoshop, Adobe Illustrator, CorelDraw, XHTML/HTML5/CSS Conversion.